Canadian Ecosocialist Ian Angus speaking in Oakland on April 25th -- "How to make an Ecosocialist Revolution"
Re: I Stood up to the Supreme Court. It Just Struck Down Democracy. What now? This article was great. except for one thing that fox and other right wingers have rammed down our throats. "radical" describes leftist action. "reactionary" is a great and powerful word for right-wingers. This article is completely unsatisfactory because Houseman and Bacon don't say HOW to reduce the trade deficit and create a resurgence of manufacturing jobs. The only method they propose is to lower the value of the dollar to make the US more competitive in international trade--an ideas even more morally rotten than it is stupid. Can't you see that that is a zero-sum game, which can only benefit US workers by hurting Chinese workers? Can't they comprehend that what is needed is policies that will benefit the whole working class of the world? Their idealization of competition ignores the fact that competition creates more losers than winners globally. The only policy that will do any good is to redistribute the wealth from the rich to the poor via heavy progressive taxation of the rich and corporations, and use the revenues to create jobs of all kinds all over the world. We need to stop importing anything, produce ourselves everything we use or consume, and help China and other poor countries develop and create jobs for their own people by vastly increasing foreign aid. Furthermore, we should think about whether all this job-destroying automation is really desirable, and if not then we should put a stop to it--by, among other things stopping allowing corporations to deduct the cost of labor-saving machinery from their taxable income. But if it should turn out that more unemployed people want mfg jobs than are needed to manufacture all the goods that can be sold, then the mfg jobs need to be SHARED so that ALL can work at them at least part-time; and where that practice might tend to reduce worker incomes, then the government must step in to subsidize higher wages. I'm not so sure the idolatry expressed by Esiason & Francesca was for the idol of Masculinity as much as for the idol of Money. Though both were talking about sports, that was almost accidentally the arena. The real issue in what they both said was the ability to get lots and lots of Money from their bosses who would get it from sports fans by having stars show up on Opening Day. "I would also add that the only reason Daniel Murphy even had the option to take this time off is because it was collectively bargained into his contract by his union. There are millions of men in nonunion jobs who don't even have this option, not to mention millions of women who risk their employment in the United States by taking time off after the birth of their child." Not only was Mr.. Murphy correct in his decision to be present at the birth of his child, it is his legal right to do so. More than the collective bargaining agreement protects this right. The Family and Medical Leave Act, FMLA, protects this right for employees of private employers with more than 100 employees. Mr. Zirin leaves the impression that millions of Americans would like to do as Mr. Murphy did but cannot because their company policies embody pre 1985 or 1955 attitudes and the FMLA does not exist. Frankly, given the gravity of argument put forth, one would think Mr. Zirin would favor accuracy about the legal environment over the misleading omission of the FMLA. As to the outrageous Messrs Esiason and Francesa - refuse to watch or listen to them and tell their employers and sponsors why. Otherwise they will not learn to respect the fundamental human needs they trample upon. The disrespect they heaped upon the Murphy family may well be unforgivable. I'm delighted by the possibility that Bernie Sanders might make a run for President and I appreciate Bill Fletcher's comments about that possibility. I would like to make a few observations. 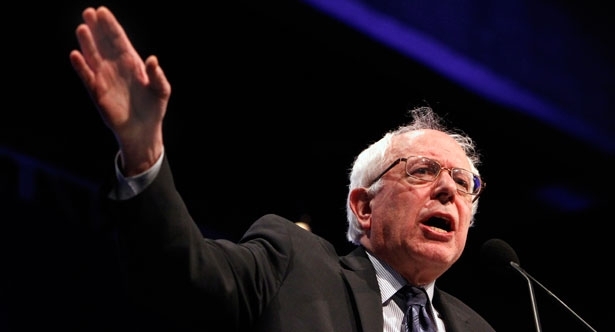 If Bernie runs for President as an independent, both he and his campaign will be marginal. It would be a campaign supported by those who think that the Democratic Party is the incarnation of demonic evil (never mind the Congressional Progressive, Black, Latino, and Asian Caucuses that have more than 70 Democratic members) and that the direction of the campaign would be to denounce the Democrats. Progressive Democrats would be alienated from him and the campaign and he would be reduced to being a cult figure. Since Bernie is much smarter than that (he is from Brooklyn), I can't imagine him undertaking such a Naderesque crusade. I really hope that Bernie challenges Hilary in the Democratic primaries. That would create the space for a progressive domestic and foreign policy platform, providing the basis for organization, and deepening the power of progressives in elections and in relation to elected officials. I'll expand on this. All other things beings equal, (if Bernie doesn't run) the 2016 Democratic primary will be a coronation of Hilary Clinton and her neo-liberal and hawkish approaches to domestic and foreign policy. And barring some kind of disastrous surge from the right, she will be the next President. It will be a great victory, both real and symbolic, for women but, in my view, a setback for progressive change. On the other hand, if Clinton comes into office with a fully energized and organized progressive movement, fresh from supporting a primary challenge from Bernie, on her left flank, then progressives have a momentum that can help to support and expand the Congressional Progressive Caucus and apply increased pressure on less progressive Democrats in the new Congress. If a Bernie run in the Democratic primaries leads to a grand national progressive coalition that supports the Budget of the Congressional Progressive Caucus, that would signify a great advance in developing national progressive organization. In my view, it's a sign of the national and local political fragmentation of progressives that this budget has not been supported and popularized by every union, social justice and environmental organization, women's organization, and the like. I can already hear myself being denounced by those who regard this kind of thinking as opportunist, making a deal with the devil, diverting the revolutionary passion of the masses, and worst of all, dealing with Democrats. But, like many of Portside's readers, I've been at this for a long time and I've learned some lessons. 1. The notion of "outside of the two party system" doesn't work in most places in this country because the laws have been fashioned to effectively exclude small parties from the ballot. There are a few states like New York in which "third parties" can have an impact, but there are only a few. So if you want to do electoral politics, you've got to do it within the framework of the two party system - and that means the Democrats. If you want to run a third party candidate for President or Governor or whatever in California or most other places, please don't call it politics. Be real and call it religious witness. 2. Progressives and generally decent minded people who are involved in electoral politics individually, through their unions, through their communities, or through their social justice organizations are in relation to Democratic elected officials. They don't have much choice in the matter. Some of the "electeds" are pretty good, some of them are decent, and some of them are what we in the Bay Area call "business Democrats". All of them need to be pushed and even be pushed hard on the hard issues like tax reform, fracking, prison reform, health care and the like. That's because they operate in an arena where the clash of class and social interests is direct and intense. 3. By and large, progressives don't operate in any kind of organizationally unified way. There are a multitude of single issue or single cause organizations which may consult with each other and even act together in Washington and state capitols but do not talk to each other locally. There is no organizational form within which they can act together and within which progressives of all sorts can find a common home. 4. Which leads me to the problem of national organization arising from Presidential campaigns - whether Jesse Jackson, Howard Dean, Dennis Kucinich, or Barack Obama. Or even Bernie Sanders. I think that the only way to have long term, stable progressive national organization is by having long term and stable progressive local organizations that address local, state, and national issues. I think that Bernie running in the Democratic Primaries can be a catalyst to the energizing and creation of such organizations. And I think that national conversation among such local organizations can result from a national campaign. But I think that the notion of a national organization coming from national campaign is expecting too much. We do have two national organizations that came out of national presidential campaigns: PDA and DFA. In my experience, these are good organizations. They mobilize grassroots support for inside the beltway lobbying efforts on very important issues and they provide a lot of good information. But, in my experience, they do not lead to stable, deeply rooted local organization. and consequently, they do not exercise power on the local and congressional level. In this regard, I'd like to address some of my personal political experiences. A decade ago, a bunch of us veterans of just about everything started the Wellstone Democratic Renewal Club in Oakland/Berkeley (that's Northern California for those who don't know). And we're represented in Congress by Barbara Lee. The Wellstone Club is a chartered Democratic Club in Alameda County, represented on the Alameda County Democratic Central Committee (as an old red, it amuses me no end to hear Democrats refer to the Party and the Central Committee). Our membership fluctuates around 300 and many of these folks will support/participate in specific activities. So I'd like to give you an idea of what we've been up to over the years. We've done some massive voter registration drives, taken the lead in clarifying that former felons have the right to vote and registering them, sent scores of our members to campaign in turning Red congressional seats Blue in California, organized for single payer, organized against the Iraq and Afghanistan Wars among Democratic Clubs and with public officials, been instrumental in pushing election protection procedures in California, pushing our legislators to support a moratorium on fracking, organizing support to amend Proposition 13 (the original don't Tax the Rich act in California), and now we are working closely with the Central Labor Council in pushing for a minimum wage increase in Berkeley and Oakland. The Alameda County Democratic Central Committee voted for our proposals to reduce the military budget and to support Occupy Oakland. We are also part of the more progressive stream in the California Democratic Party. We endorse candidates and issue our own election fliers. That's the up side. There are a few down sides. First, we are a virtually all white club and we have a collective memory of the sixties. Second, we are the only organization of our kind in an intensely multiracial region that is bursting with all kinds of social change activity. What this means is that the various movements around a whole bunch of issues do not have a common organizational meeting ground where they can reinforce each others work. As a consequence, the local elected officials - and many of them are relatively decent - don't feel the concerted pressure to act in a progressive way that they require in order to stand up to the powerful corporate and institutional interests. So even though we're represented by Barbara Lee, we still have charter schools running rampant, a retrograde Oakland police force, a three strikes DA, State Assemblymembers and Senators who won't step up on tax reform and tracking, etc. And although there has been considerable progressive ferment in the California Democratic Party, we don't have an organization of progressive Democratic Clubs that can collectively wield power. 1. Progressives don't have to invent a political framework for national conversation and organization. The Congressional Progressive Caucus budget is there. Support it. Organize for it. Make it into the common property of the complex and many faceted progressive movement. 2. Bernie Sanders running in the Democratic Presidential Primaries would be a godsend for organizing around progressive political alternatives. 3. That level of organization could be extended into the November 2016 congressional elections, working to defeat Republicans and achieving a Democratic majority in the House. Yes, I know, there's the word Democrats again. But I contend that Democratic majorities in the House and Senate provides for better political terrain for setting back the neocons in both parties and advancing a progressive program. 4. Hopefully, a national campaign for Sanders might help the process of building longer term local coalitions around local issues and elections. 5. Of course there's the danger of compromising your integrity and losing your soul if you actually engage the real existing political process. Big Deal. Re: NASA Funded Study: Industrial Civilisation Headed for 'Irreversible Collapse'? What did that `NASA-funded collapse study' really say? Climate & Capitalism, posted at Links International Journal of Socialist Renewal with permission -- If hundreds of newspaper and online reports are to be believed, scientists at NASA's Goddard Space Agency have proven that Western civilisation will collapse unless we radically reduce inequality and shift to renewable resources. Ian Angus, Canadian Ecosocialist Activist, founder and editor of Climate and Capitalism, an ecosocialist journal, which reflects the perspective of ecological Marxism. He is the author of The Global Fight for Climate Justice: Anticapitalist Responses to Global Warming and Ecological Destruction (2010); and Too Many People? Population, Immigration, and the Environmental Crisis (2011).